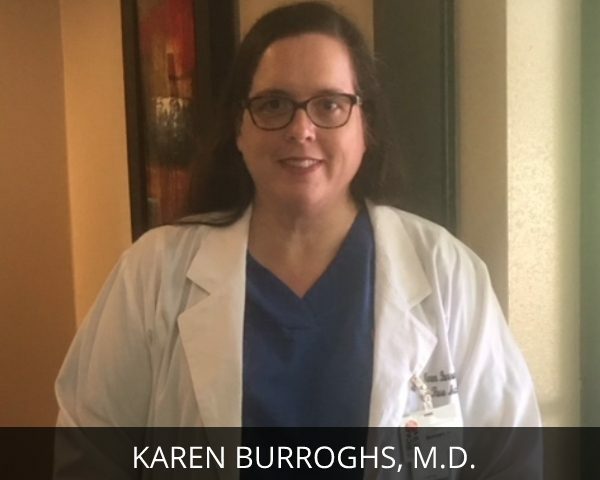 Karen Burroughs, MD | Glen Rose Healthcare, Inc.
Karen Burroughs, MD has been in private practice in Glen Rose for the last 9 years. She cared for patients though Stephenville Medical and Surgical Clinic for the 14 years prior to local practice. She was trained in Family Medicine through Memorial Medical Center in Corpus Christi and completed medical school at University of Texas Health Science Center in Houston. Karen is a proud Aggie, graduating from Texas A&M University with a degree in Biology. She enjoys all aspects of family medicine with special interest in preventative medicine, women’s health, pediatrics and chronic disease management. Karen loves her wonderful family, spouse John and children Kathryn and Nathan. When time allows, leisure interests are traveling and landing on a beach anywhere.